I have always loved looking at world globes and ones with a little Old World feel always catch my eye. 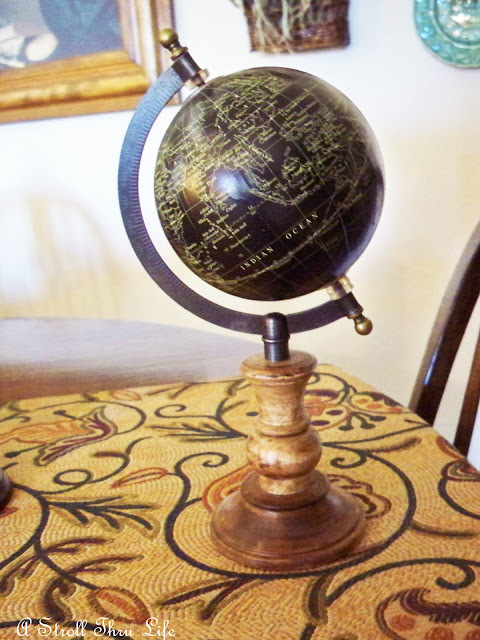 I have 2 other globes and it's amazing how the old ones show our world a little differently than today. I found this one recently at Ross. Not old, but it does have that Old World feel and look. Of course it had to go in the bookcase for now. Just rearrange a few books and there's plenty of room. Love the look. Perfect size and the black of the globe is so pretty. This side of the bookcase got a new little addition also. 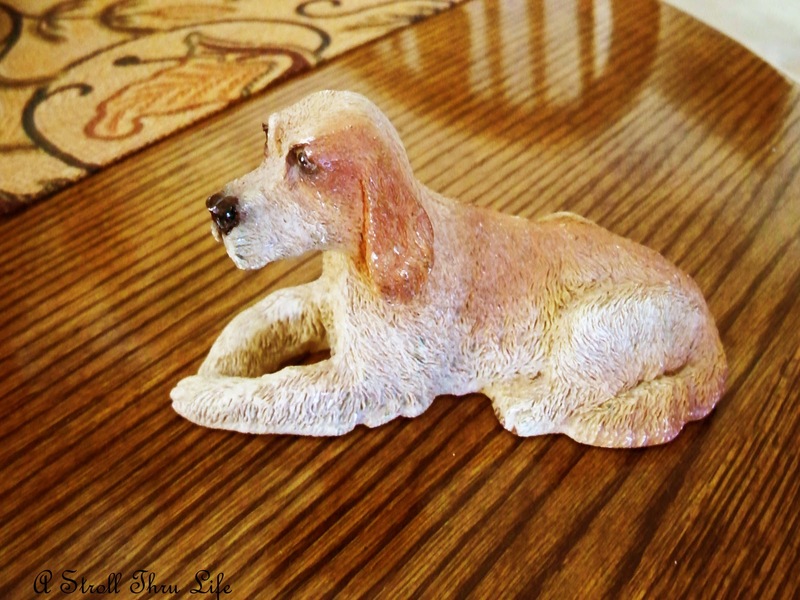 While going through boxes the other day, I came across this little dog figurine, so of course he had to join my dog display. I've had this little guy for years, poor little thing was still stuck in a box. Fits right in on this shelf. 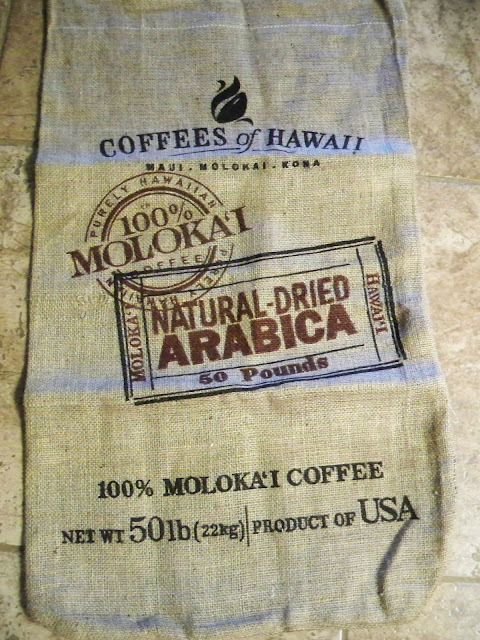 Also, don't forget my Burlap Coffee Bag giveaway. You can find all the details and enter here. Such a neat bag that I found in Hawaii and a super size. Perfect for a couple of pillows or a neat tablerunner. It's also large enough to cover the back and cushion of a chair. I would love for you to enter, and hope you win. That little globe is so cute - great find! I also love your little dog. It's so fun to go through things you've not seen for awhile and find something you'd forgotten about. You found the perfect place for him! That globe is great...hey, went to my GW today....and guess what??? yep, that's right, NOTHING!! :) I remember..( I do that often)..when I went to join Patrick on R&R in Hawaii. We shipped home cases of Pineapples! :) For friends, not for us. Wow..lots you can do with that bag..but the little dog you found in a box. There must be a reason you came across him. There is always a reason..isn't there.. I love globes too and love how you have it displayed on your shelf. Great little dog too! I love globes too. Your new one looks perfect on your bookshelf. That globe is just perfect! I am glad you let your little doggie out of the box. I found a globe just like that one at a garage sale a couple of weeks ago! Love it! And love how you are displaying yours! Perfect size, Marty! I love it on your bookshelves. Cute little dog, too. I've been finding some things I packed up two years ago when we originally hoped to move; things I forgot all about! Of course, some of mine are going to go to the local thrift store. I just don't have the room anymore! That is a really neat looking globe Marty. Cute little dog too. I never see any cute ones. I have to start really looking. I love them, they make for great displays. Marty, I am bookmarking this post. I have such trouble with my bookcases! I just can't seem to get them right. Yours are gorgeous. You pick out the perfect things! Mine seem cluttered! Also I LOVE that your bookcases are lit. Beautiful! I love the globe. 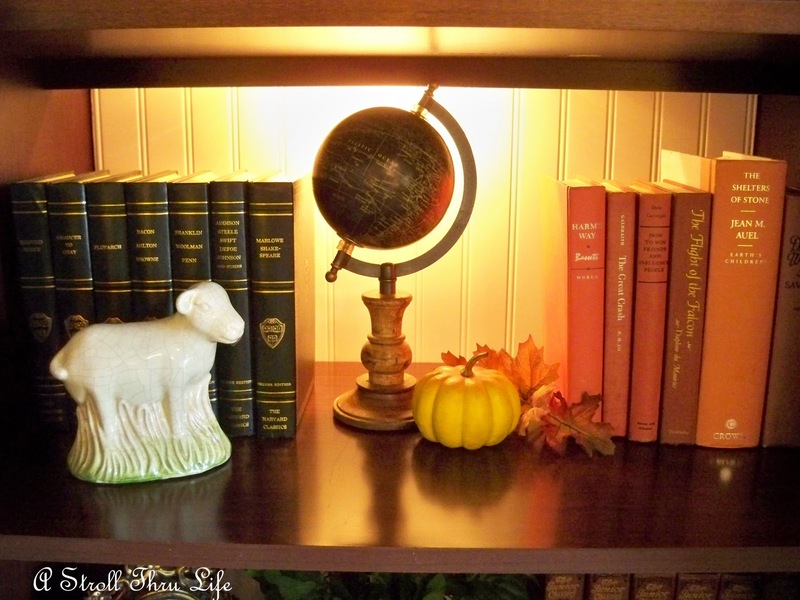 Perfect fit on your bookcase and the black globe just pops next to the back of the bookcase. Love it! Marty, I love your new additions. How fun finding that dog put away. I think that is a really neat globe. Love the size of it too. Thanks for the giveaway. I found your blog through Kelli's. Very nice to meet you. I wanted to invite you to my cottage giveaway. I hope you drop by. The little dog is to die for. Your bookcase is always so beautiful. I once had a mustard colored globe but ended up selling it at a consignment store. It just didn't work out in my decor any longer. I really like the black better that you have! I think it would be more versatile. 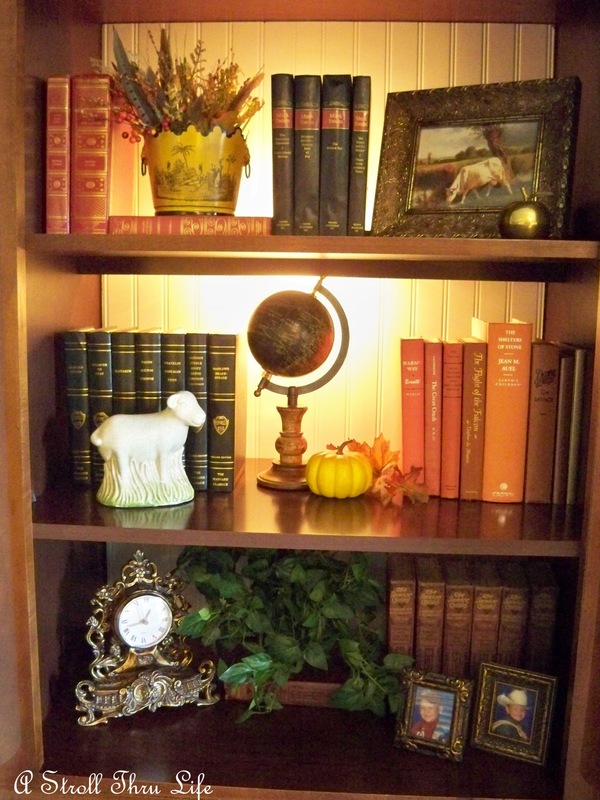 It looks perfect in your bookcase among your other accessories and books. How lovely! I think globes are so fun. I love your little globe & how you have it displayed!! 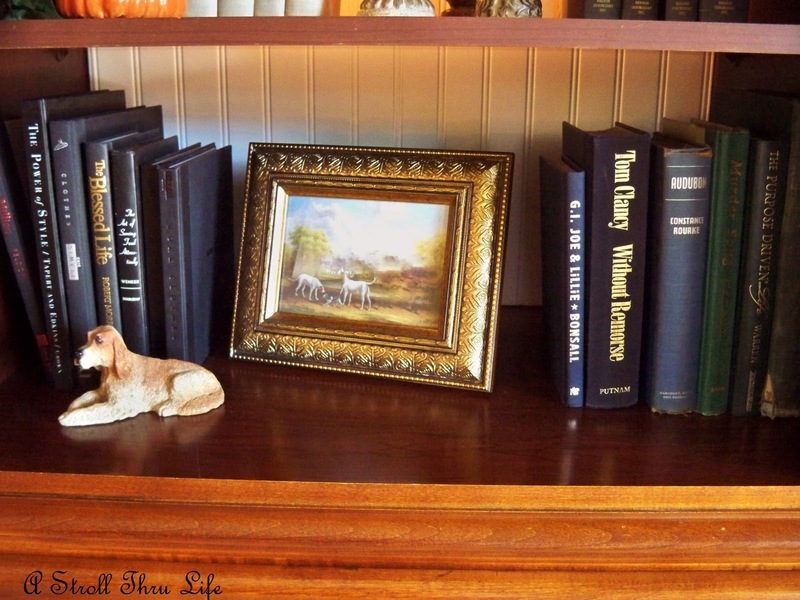 You have a real gift at decorating bookshelves!! Hi Marty...Hope Hawaii was all and more of what you were expecting...Glad you are back.. I have a small globe that I just love! It is in Hubby's office.. I also love the Globe sweet lady. We don't have a globe in the house, but I really like your new one. It is the perfect size and it was made for the shelf! Love that! That little globe is so cute, I found a globe just like that one at a garage sale a couple of weeks ago, It's so fun to go through things you've not seen for awhile and find something you'd forgotten about. I love the size of this globe. 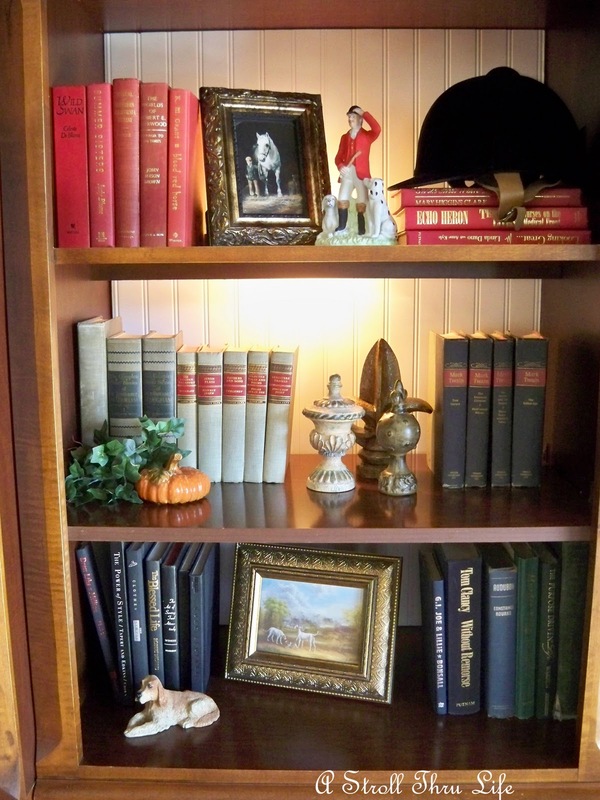 It's great to tuck into a bookcase. And you found it at Ross, even better!